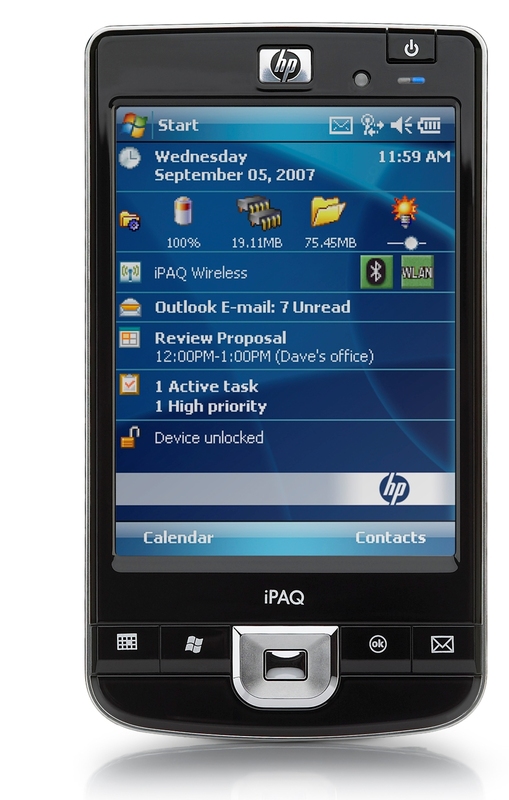 Update: Brighthand now has a very comprehensive iPAQ 210 Review which can be found HERE. Over the last couple of years, all the new and exciting devices seemed to be phone based handhelds. The “traditional” non-phone PDA seemed to be going the way of the dinosaur. Even more scarce were devices with a “VGA” screen. Two of the more popular and readily available VGA PocketPC’s were the HP hx4700 and Dell x51v. Sadly, both devices were discontinued in 2007 leaving it nearly impossible to find a high-res VGA handheld. Recently I’ve had a number of queries from individuals looking for a VGA handheld and until now I’ve not been able to give them a good answer. Screen size – Most VGA devices have much larger screens than a typical PocketPC. Like the older discontinued VGA PocketPC’s, the new iPaq 200 has a 4″ screen. Resolution – Out of the box, what you see displayed is not much different than a typical QVGA PocketPC. However, since there is 4 times the number of pixels, the resolution makes the text and images MUCH chrisper. Information display – If the application supports changing the sizes of displayable fonts, which Pocket Genealogist does, then you CAN get more information on the screen. (and the sharper resolution means smaller text is much more readable than on a QVGA display) Click HERE and HERE to see screen images of Pocket Genealogist on a VGA screen. For additional information and commentary about all 5 new HP devices, see Brighthand, Pocket PC Thoughts, and PocketNow. This entry was posted on Friday, March 21st, 2008 at 20:50 and is filed under Hardware, Windows Mobile. You can follow any responses to this entry through the RSS 2.0 feed. You can leave a response, or trackback from your own site. Great article Kevin. It sure seems like the non-phone PDA is dying off. I hate to see it but I understand people’s desire for multi-task devices. I have an HP iPac and it’s great except for the wifi, that never has worked well for me. It has difficulty seeing and connecting to “public” networks. It runs Pocket Genealogist just great though! I wrote an article on my Creative Gene blog about your new blog. Welcome to the genealogy-blogging community! I don’t know whether to abandon having a combined phone and PDA and have separate thoroughbreds instead. Incidentally with SD cards now providing gigabytes of storage it would be possible to carry around a database of photos. The currently unfolding Family Tree Maker 2008 debacle (see http://boards.ancestry.com/topics.software.famtreemaker/mb.ashx) has had the one advantage of enabling me to extract the embedded images from my older FTM file. I am experimenting with Family Historian which uses Gedcom files as its native file format and provides for links to images. Hopefully Pocket Genealogist will one day do this too. I think a lot of people have the same difficult decision to make. In some cases with the combination, you get a phone that’s not quite as nice as a standalone and a PDA that’s not as powerful as a standalone. (Generally the processor that goes into the phone is slower so as to save battery life) It’s up to the user to decide if the convenience of the combination outweights any compromises made to combine a phone and PDA. Then you also have the Smartphones that don’t have a touchscreen, you get an entirely different user experience. I have to admit, the short time I was using a T-Mobile Dash, I was surprised to find I liked it and didn’t miss the touchscreen too much. (And Pocket Genealogist now supports both touchscreen and non-touchscreen Smartphones) I’ve since switched from T-Mobile to Alltel and can no longer use the Dash, so my daily phone is now a Palm 700wx. (Windows Mobile of course) It’s not a bad device, but I’ve found for general phone use, I liked the Dash better. There are some pretty powerful phone based PDA’s on the market though, I’ll look at having an article on the high-end Smartphones in a future posting. I am also on the fence as yet, about whether or not to switch to a pda/phone combo or keep them separate. What do you think of the blackberry for verizon? Which would be better, a palm treo (w/windows mobile of course) or a blackberry. or what about the Q? 2. The Treo 700w (700wx) is nice in the sense that’s it’s a touchscreen smartphone, but it does have a “square” screen (240 x 240) which will limit your software choices. Pocket Genealogist DOES support square screen. From a usability point of view. 1. If your cell provider has a local store front, go get a hands on with the devices you are interested in, they can be quite different. (And non-touchscreen devices are very different) For example, the Q is a very “slim” device and the Treo is kind of “pudgy”. Hope this helps, we’ll see about posting an article about smartphones soon.